Yesterday, I detailed some advantages of bus-rapid transit (BRT) over the much more pricey streetcar and light-rail options that the Greater Greater Washington blog plugs very aggressively (yesterday’s example here) but now appear to be going nowhere. So what is the barrier to BRT gaining more traction? That fact, laid out in a 2009 report from the Federal Transit Administration, isn’t surprising, but it has led to a perverse outcome: Transit agencies are spending millions of dollars on new rail infrastructure that is no faster than existing bus service, simply because riders perceive a train as better than a bus. Barro details how New York is now planning to spend $1 billion on an AirTrain from LaGuardia Airport that will go no faster than the existing bus connections. 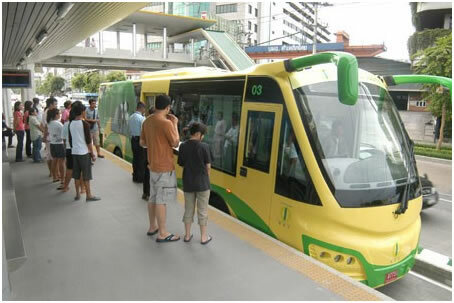 He reports similar investments in streetcars and trains elsewhere that go no or little faster than existing bus routes. In Washington, the proposed streetcar slows down far more people on buses than will ride the streetcar. This isn’t “greater” but grandiose public policy that wastes billions of transit dollars. Indeed, it’s really corporate welfare masked as social justice as it benefits property developers. There is nothing wrong with benefiting developers or other companies if we think that makes good transit policy and economic sense. But it just becomes corporate welfare when we can get the benefits much more cheaply through another similar technology. That 2009 transit report gives reason to believe it’s possible. The researchers conducted focus groups with “choice riders” in Los Angeles: people who have cars but sometimes use transit. These riders had an unsurprising preference for trains. 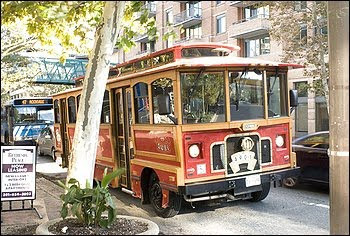 We can even make them look like streetcars, complete with hard and uncomfortable benches, as the former Bethesda Circulator bus (shown at top) demonstrated for many years. People still ride it even though it now looks like a bright red bus. These design features and marketing simply have to be far less expensive than the literally billions of dollars more that streetcars and light-rail cost to do the same thing. The good news is that BRT is expanding around the country and so hopefully the unfamiliarity with it will decrease. Public officials along with transit advocates need to get past the idea that trains are better and more elite or equivalent to faster, heavy rail Metro. They’re not. They just waste dollars that could used be to provide more public transit or something else useful. The sooner they realize it, the sooner we might stop spinning our wheels and build something useful and affordable. The Purple Line received some good news the other day when the Federal Transit Administration (FTA) recommended both the Purple Line and Red Line for a full funding grant agreement. Both are included in President Obama’s budget with $100 million budgeted for the Purple Line. The president’s proposal is a long way from a final budget–if Congress can even agree on a budget in this election year. But it is a step forward for the Purple Line, as federal funding is vital to the planned light-rail line. Proponents of the project are understandably pleased with this announcement. the initial $1.2 billion estimate in 2001 probably was based on broad assumptions, such as the average cost per mile for rail construction nationally. As the state has refined the Purple Line design, he said, engineers have found more “challenges” that add costs. . . .
“The [cost estimate] number at that time [in 2001] would have been based on lines on a map,” Kay said. About 30 percent of the project has been designed, he said, enough to form more precise cost projections. The excuse that cost estimates have risen because the earlier estimates were only rough estimates is suspicious if only because cost estimates have always increased. They never decline. If the estimates are unbiased, the errors shouldn’t be off only in one direction. The State also doesn’t mention that Maryland foots the entire bill for every increase. FTA has recommended $900 million in funding. That amount will not increase and may decline. So the amount that the State is on the hook for the project just increased from $1.34 billion to $1.47 billion–a 10% increase. And that means $126 million less for all other transportation projects in the State of Maryland. It also means that Montgomery and Prince George’s Counties will receive less for other projects since more funds dedicated to this part of the State will have to go to pay for the Purple Line. One might expect further cost increases if only because Parsons Brinckerhoff is involved. This is the same firm that engineered the botched and way over budget Silver Spring Transit Center. The Center is supposed to accommodate the new Purple Line. Henry Kay says he has “a high level of confidence” that the new cost estimates are accurate. If so, that would be good news for the State and the future of the Purple Line project.